These are tricks that use the Single Stick Handoff while passing the second handstick in different ways. Be sure you can do the Single Stick Handoff continuously. I'll describe the first variation in detail, and then list other ways to pass the second handstick. Starting from an Idle, when the devilstick lands on the right handstick, put the left handstick in your mouth. When you put the handstick in your mouth it should be horizontal and you should bite down on the middle of the handstick. Now give the devilstick a half flip with the right handstick. While the devilstick is flipping, hand the right handstick to the left hand (Single Stick Handoff). After the handoff, take the handstick out of your mouth with your right hand. As you do this the left handstick will be catching the devilstick. 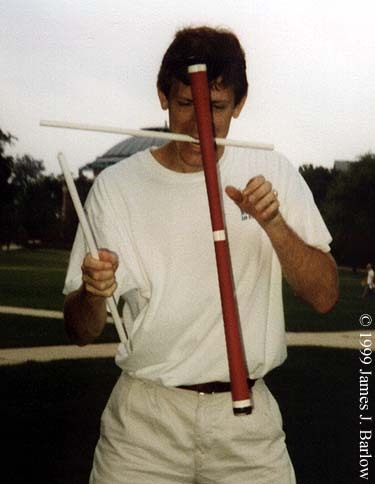 You can then toss the devilstick back to the right side and go into a different trick or do this continuously. It is much easier if the half flip of the devilstick is a little slower that usual. This will give you time for the handstick passes. On the chin - Balancing it vertically or horizontally. In the crotch of the leg behind the knee. Tossing the handstick in the air - This can either be above or below the other handstick being handed across. Windsheild Wiper - The pass is a toss in the air, but try to make the toss such that the handstick is parallel to your body and sweeps across like a windsheild wiper. I got this idea from a club juggling trick. Behind Back - Do a behind the back throw of the handstick during the handoff. The throw will most likely be easiest if the handstick does a full flip (similar to a club juggling throw). Dip - This throw is done such that the handstick spins in a propeller like fashion. If the right hand does a dip throw, the handstick will be spinning clockwise. This is a club juggling throw and gets it's name from the dipping action right before the toss. It will be easiest if the handstick does a one and a half flip or double flip. Over The Top - This is similar to the Dip, except that the throw will go in the opposite direction. It also has a propeller like spin and a right hand throw will spin counter-clockwise. Flat Spin - This is also called a helicopter spin because the handstick will be thrown with a spin like a helicopter. This is a bit difficult with a handstick, but can be done. However, I think the Dip and Over the Top look much better. As you can see from many of the examples above, you can do almost any club juggling throw for the second handstick pass. Back to General Tricks Page.